The worst rout in the history of American college football was administered by mighty Georgia Tech against tiny Cumberland College on October 7, 1916. The final score was 222-0. There were some extenuating circumstances. 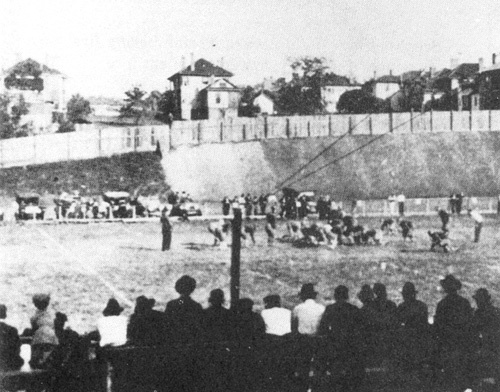 Cumberland had signed a contract a year in advance to play Georgia Tech in Atlanta in 1916, but discontinued its football program after the 1915 season. However, the contract with Tech included a hefty $3,000 forfeit penalty if Cumberland failed to put a team on the field against Tech. Instead of paying the fine, Cumberland threw together a team on short notice. The team never held a single practise. One player, a law student, recalled years later, 'We put a lot of faith in the clause about placing a team on the field. There was nothing in the contract requiring us to play well.' Tech coach John Heisman showed no mercy. His squad scored nine touchdowns in both the first and second quarters to lead 126-0 at halftime. Tech agreed to shorten the third and fourth quarters and only scored 14 more touchdowns. In all, Tech scored 32 touchdowns (and 30 conversions). Tech also amassed 1,650 yards rushing on just 40 attempts. Cumberland's rushing total was -96 yards. They did complete two passes, though. Tech did not attempt a pass all game. Most interesting stat: There were no first downs by either team. All of Tech's big plays went for touchdowns. Cumberland's biggest play was a 10-yard pass completion on a fourth-and-28 situation. Despite their historic defeat, the Cumberland players returned to their Lebanon, TN campus as heroes for saving their small school $3,000.